The rare eclipse is not the only astronomical event set for this week. Jupiter and Venus will shine bright together before dawn on Tuesday in an astronomical event known as a conjunction. 'Together, the two objects will make for a spectacular 'double planet' in the dawn twilight,' according to Space.com. Weather permitting, you'll be able to see them with the naked eye. On Tuesday, they will be separated by 2.4 degrees, roughly five times the apparent width of the full moon. Astronomers have been following Venus for the past few months as it becomes more and more prominent in the morning sky. Then, around a month ago, Jupiter also began emerging from behind the glare of the sun - setting the stage for tomorrow night. Accuweather says that it will be hard to miss the two planets in the southeastern sky early on Tuesday morning, with Venus being the brighter of the two. 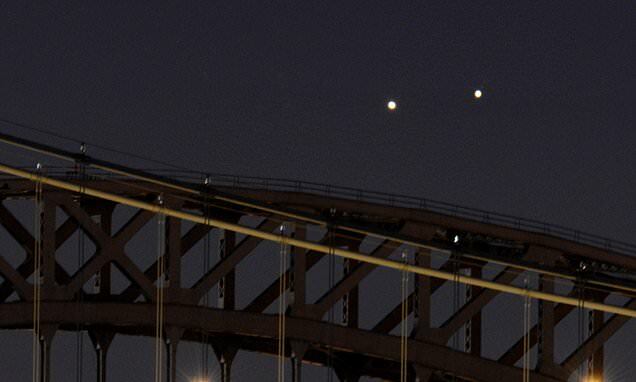 'The Jupiter and Venus conjunction will be easily bright enough to see from any location, even large cities,' NASA says . The pair of planets will be rising together, climbing above the horizon by 5am. Although they will appear right next to each other in the sky, the two planets will actually be over 400 million miles apart. Venus and Jupiter are the third and fourth brightest celestial bodies after the sun and moon, so they will be easy to spot.